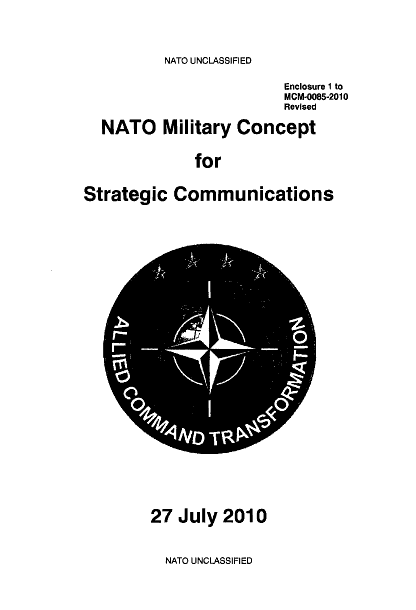 The following is NATO’s military concept for strategic communications. Though unclassified, NATO doctrine and policy documents are not released to the public. 1-1. Strategic Communications (StratCom) has emerged as an increasingly vital field of Alliance endeavour in recent years. There have been several attempts to address Strategic Communications in an Alliance context, including the publication of a North Atlantic Council endorsed NATO Strategic Communications Policy, the publication of Strategic Command directives, and the establishment of positions in various headquarters to lead its implementation. 1-2. Despite the high level of interest and attention, Strategic Communications is still a field in its initial stages of development, both for the Alliance and the Nations. 1-3. All aspects of NATO activities have a critical information and communications component. This concept proposes that Strategic Communications is not an adjunct activity, but should be inherent in the planning and conduct of all military operations and activities. As part of the overarching political-military approach to Strategic Communications within NATO, the vision is to put Strategic Communications at the heart of all levels of military policy, planning and execution, and then, as a fully integrated part of the overall effort, ensure the development of a practical, effective strategy that makes a real contribution to success. 1-4. The aim of NATO Strategic Communications is to ensure that NATO’s audiences, whether in the Nations or in a region where a NATO operation is taking place, either friendly or adversarial, receives truthful, accurate and timely information that will allow them to understand and assess the Alliance’s actions and intentions. This will deter aggression and promote NATO’s alms and objectives. a. In NATO military structures, the authority to communicate or release information, including imagery and other communication products, has traditionally been restricted to high levels within the command structure. Effective support to Strategic Communications is enhanced by military commanders choosing to delegate communication authority widely, empowering more personnel to communicate the NATO narrative through actions, words and imagery. b. This requires military leaders to maintain awareness of information released and the ability to refine this information as necessary to ensure its accuracy. Commanders must balance the requirement for speed in the release of information with legitimate concerns for its accuracy and the demands of operational security. In the current and foreseeable future global information environment, the use of new and emerging technology such as internet or mobile telephone based Social Media has resulted In a requirement to release information in as close to real time as possible; as events unfold, not minutes or hours later. By empowering more of our people to communicate, NATO will help ensure that it Is not only the best source of information about the Alliance that gets out, but the first. best source as we”. The willingness of leaders to empower is dependent upon their confidence in the community of interest achieved through successful training and education. b. The ability to coordinate NATO and coalition information and communications activities with the efforts of other agencies and partners within the context of a broader NATO strategy, in accordance with the Comprehensive Approach Action Plan1on the aspects it addresses. (1) Identify potential outside agencies with influence efforts in the operational area. (2) Establish robust liaison, support and working agreements, to include structures, processes and permissions for Sharing information with partners. (3) Coordinate with outside agencies in assessing the perceptions, attitudes, behaviours and beliefs of potential audiences. (4) Coordinate with outside agencies to establish objectives, determine courses of action, and deliver messages. (5) Collaborate with other agencies and mission partners in detecting, monitoring, translating and assessing the effects of NATO and others’ influence efforts. c. The ability to access, produce and maintain updated information and knowledge on the perceptions attitudes, behaviours and beliefs of potential audiences. (1) Identify and segment potential audiences. (2) Access, collect, produce and maintain existing knowledge databases on perceptions, attitudes and beliefs of the selected audience(s). (3) Establish close coordination with existing intelligence assets. (4) Conduct social network analysis of selected audiences. (5) Collect market research information on the perceptions, attitudes, behaviours and beliefs of the selected audiences from external organizations, or hire external organizations to perform such research. d. The ability to access, produce and maintain updated information and knowledge on complex social communication systems, to include the characteristics of various media agencies. (1) Identify relevant communication channels, social communication systems and media agencies affecting the NATO and coalition operations area. (2) Analyse the flow and change of information through relevant communication channels, social communication systems and media agencies.